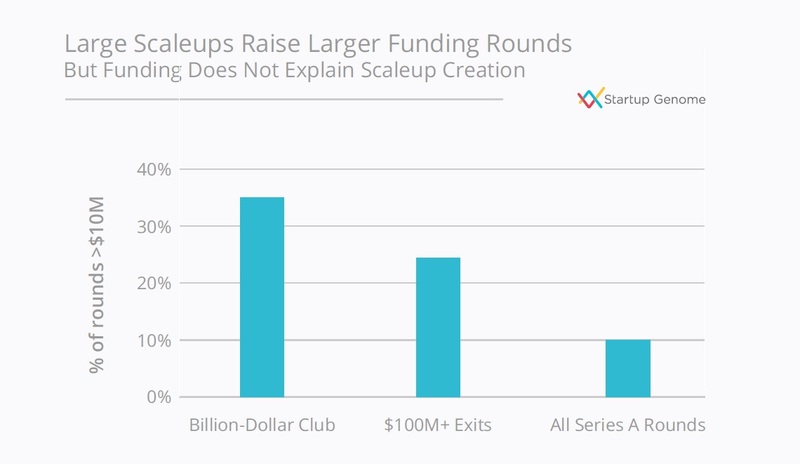 Breaking the Myth- Larger funding rounds signal Scaleup Creation? Scaleup firms or firms showing high growth generally raise larger funding rounds than non-scaleups. It is often a perceived notion that firms raising larger funding tend to become scaleups. According to Startup Genome’s latest report, it observed that large scaleups (those companies reaching billion-dollar valuation and those having exits over $100 million) raise more than $10 million in series A compared to all other Series A rounds. Looking at this statistic, an inference can be drawn that larger funding rounds signal that a startup is on the way to become a scaleup or even a unicorn. Policymakers take this logic seriously and start making plans to pour more money to increase funding rounds. However, this approach is quite flawed and has led to many ill-advised funding rounds. 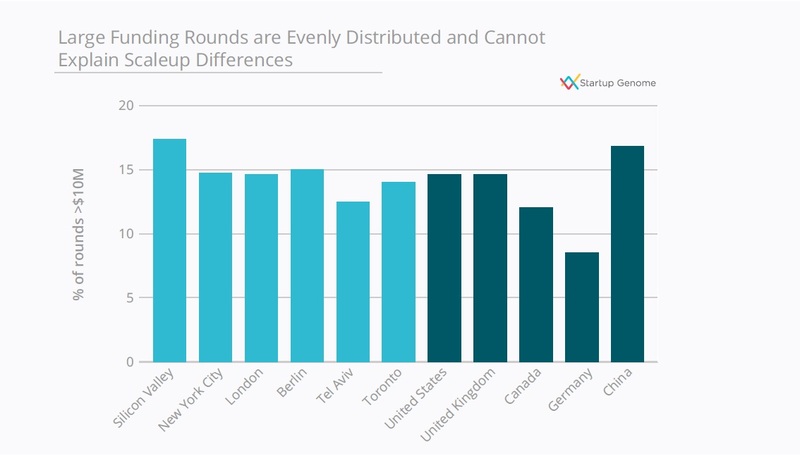 Considering the distribution of large funding rounds across different regions and countries, the Startup Genome Report goes on to show that startups in Toronto raise a similar number of large Series A rounds as those in London and even more than those in Tel Aviv. However, Tel Aviv produces approximately 2.5 times more scaleups than those produced by Toronto. The number of scaleups produced by Tel Aviv is about the same as the number of scaleups produced by London over the past decade. The top startups in Toronto are able to raise large funding rounds but most of these rounds come from foreign investors who are mostly out of Toronto’s ecosystem. The reason behind this phenomenon is not that Toronto’s best startups are lacking funding access but that they are simply going outside their ecosystem and receiving funding from international investors. So, is it the right move to increase funding round sizes in order to create scaleups? The answer, as stated by the Genome Report, however, is not to increase Series A and funding from local investors. The crux of the matter is deal flow and attrition, not the size of the round. In most of the ecosystems, other than the startup ecosystem in Silicon Valley, New York, and London, the funnel of startups narrows down rapidly between seed and Series A. The “best” startups in Toronto are able to access a large number of investments from international investors while the ones in lower tiers have to rely on local investors. Relying on local funding limits the options and it becomes even more difficult to secure funding at Series A and beyond. Consequently, the low tier startups get access to a lesser number of resources and these restraints on resources further curbs down their potential to grow. Toronto is just one example, but there are multiple ecosystems in the world which are currently in the Activation phase and a lot of them, including Frankfurt, still lack a strong presence of international investors. At the end of the day, the challenge with funding is dealflow, not the investment size. Scaleup creation can only be facilitated when the funding funnel is widened.